Fox's fourth entry in his How to Become series proves again that he has mastered the short format, advice-driven business book. The book contains 50-odd short chapters boasting a surprising amount of useful information delivered in a street-smart style. In the chapter entitled "Banish All Buying Barriers," Fox advises readers to eliminate anything that makes it difficult for customers to buy. About merchants featured in Visa ads for not accepting AmEx, he says, "Not accepting the American Express card is dumb. Bragging about it is even dumber." Fox lists words to avoid in advertising (e.g., "lifetime" and "quality") and questions to ask when drafting a marketing plan. Four "instant challenges" describe a marketing problem (e.g., how to sell shoe shines during a downpour) and ask readers to solve it. (Try a sandwich board reading: "Acid Rain! Save your shoes. Get a shine. Ask about the Rainy Day Special.") 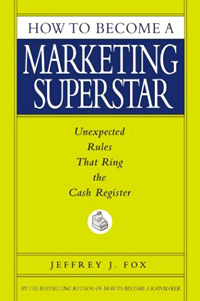 Throughout, Fox never loses sight of what he sees as marketing's ultimate goal, the "super marketer's anthem: It don't mean a thing. If it don't go ka-ching!"